Docking site is a distance from Edinburgh requiring a shuttle bus. Edinburgh is a fantastic city but due to a late arrival we didn't have enough time there. Independent visit to Britannia was very nice. Independent visit to Edinburgh Castle interesting. Again, ship was in town overnight, but no ship-to-town transportation was available after 6 pm. 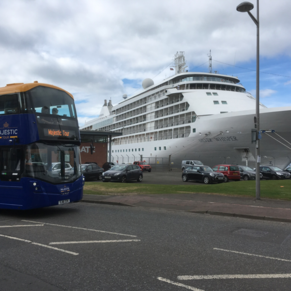 For local information about arriving in Leith, and getting around from there, have a look at CruiseForth.com. Lots of ideas and hints for your visit. See the castle. Not enough time to walk around the town. That was disappointing. We were rushed through the castle. There are currently 0 discussions about Leith (Edinburgh), Scotland.